Elderly people, especially nursing home residents, are highly vulnerable to hip and other bone fractures. This risk increases when they do not receive the assistance and support they need. Often, their injuries are severe enough to cause significant pain, lasting impairment and even death. In nursing homes, falls often occur because residents who require special assistance donâ€™t get the help they need. Older or disabled adults with chronic conditions that involve weakness and difficulty walking are especially prone to falls. The injuries they receive can be serious, including head injury or hip or other bone fractures. 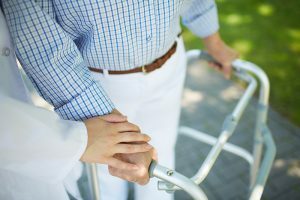 If your loved one has a balance problem or has difficulty walking, the nursing home staff should have a written plan in place to prevent falls by providing supervision and assistance while walking. They should never ignore your loved oneâ€™s desire to walk simply because assistance is necessary. If someone you care about sustained a hip fracture or other broken bone in a nursing home and you suspect abuse or neglect, take action. Speak with a lawyer about your options.